We had some initial delays in the availability of our funding, which caused us to delay the purchasing of the more costly components, specifically the mechanical parts of the rover. We made the best from the unexpected delay though and used the extra time to ensure that our mechanical design was as sound as possible. All mechanical and machined parts have been ordered and will arrive in the next couple of weeks. We have been making progress on the software and are excited for the rover to be assembled so we can test on the actual platform instead of just a simulator. The biggest change we have made is adding a 3-DOF wrist to our robotic arm, making it a 6-DOF arm. This will give us additional dexterity and increased manipulability. Our team has also grown in size since the proposal and now includes four additional undergraduate mechanical engineering students, Allison Miller, Effie Greene, Alex Adams, and Lukas Renker. In total we have four graduate and six undergraduate students on the team. One of the biggest challenges we have encountered has involved the wheels of the rover. The wheels are a very critical aspect of the rover. They are responsible for moving the rover from place to place and have several responsibilities they must fulfill. 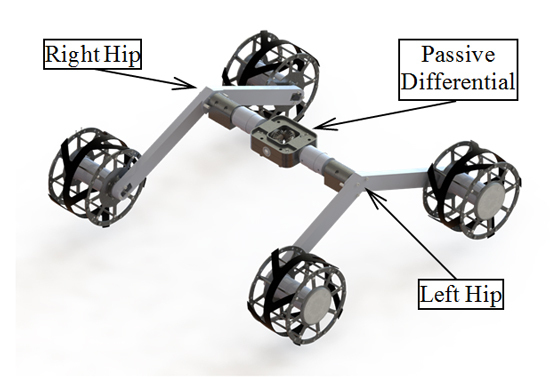 First, the wheel motors must be able to move and hold the weight of the rover without being overloaded and breaking. Second, the wheels must be able to maintain traction on the surface they are traveling over. Lastly, they must not add too much weight to the rover. We addressed the first aspect of holding the weight of the rover by correctly distributing the load of the rover off of the wheel motors and onto an aluminum tube through two ball bearings. The design we used will ensure that the motors can power the wheels of the rover without applying any axial or bending loads to the motor. For the traction aspect, we have built multiple wheel prototypes to test different tread methods and have tested them on different surfaces including sand, rocks, and compact ground. To keep the weight minimal, we have used light materials, and strategically removed material around the hubs of the wheels. 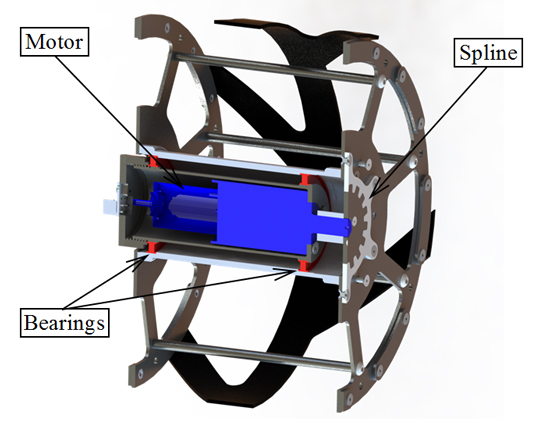 Cross section view of the ROCbot drive system. I estimate over 1500 hours among the 10 team members since we started working on the initial design proposal in September. In the next couple of months we have to assemble our rover and performing testing and more software development. The user interface for our rover is incomplete at this time, and needs more work before it will be ready for the competition. Our team consists of graduate and undergraduate students in mechanical engineering. Although we are all mechanical engineers, we all work together in a interdisciplinary research lab where we develop miniature robots for minimally invasive surgery. This research has provided us with experience in electronics, software, and mechanical design that we are utilizing to develop our rover. Our team is organized in to four main areas: Rover Chassis, Robotic Arm, Cameras/Sensors, and Control Software. The four graduate students on our team take the lead in these areas and undergraduates work on specific tasks in these areas under the graduate student's leadership. We have access to a 3D printer and laser cutter that we are utilizing to make prototypes that help us iterate through design changes quickly. We also have access to a miniature mill and lathe that we can use to make small non-critical parts for our rover. The College of Engineering also has a staffed machine shop that student organizations can have parts machined for the cost of the material. I advise future contenders to start early. There are many different aspects to this project that all take a considerable amount of time to do correctly.